Two country weddings, fifty years apart ... and the miracle of second chancesIn the tiny Tablelands township of Burralea, Flora Drummond is preparing to play in a string quartet for the wedding of a very close friend. The trouble is, she can't quite forget the silly teenage crush she once had on the handsome groom.All is as it should be on the big day. The little church is filled with flowers, the expectant guests are arriving, and Mitch is nervously awaiting his bride - but she?s had a sudden change of heart.Decades earlier, another wedding in the same church led to a similar story of betrayal and devastation. Hattie missed out on marrying her childhood sweetheart the first time around, but now she has returned to the scene of her greatest heartache.As Flora is drawn into both romantic dramas, a dark threat from her own previous relationship looms. But the past and the present offer promise for the future and Flora discovers that they might all help each other to heal.From the rolling green hills of Far North Queensland to the crowded streets of Shanghai on the eve of the Second World War, this is a beautiful romantic saga that tells of two loves lost and found and asks the questions - do we ever get over our first love, and is it ever too late to make amends?Two country weddings, fifty years apart ... and the miracle of second chancesIn the tiny Tablelands township of Burralea, Flora Drummond is preparing to play in a string quartet for the wedding of a very close friend. The trouble is, she can't quite forget the silly teenage crush she once had on the handsome groom.All is as it should be on the big day. The little church is filled with flowers, the expectant guests are arriving, and Mitch is nervously awaiting his bride - but she?s had a sudden change of heart.Decades earlier, another wedding in the same church led to a similar story of betrayal and devastation. Hattie missed out on marrying her childhood sweetheart the first time around, but now she has returned to the scene of her greatest heartache.As Flora is drawn into both romantic dramas, a dark threat from her own previous relationship looms. But the past and the present offer promise for the future and Flora discovers that they might all help each other to heal.From the rolling green hills of Far North Queensland to the crowded streets of Shanghai on the eve of the Second World War, this is a beautiful romantic saga that tells of two loves lost and found and asks the questions - do we ever get over our first love, and is it ever too late to make amends? 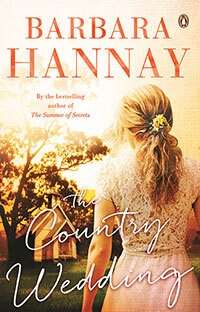 A former English teacher, Barbara Hannay is a city-bred girl with a yen for country life. Many of her forty-plus books are set in rural and outback Australia and have been enjoyed by readers around the world. She has won the RITA, awarded by Romance Writers of America, and has twice won the Romantic Book of the Year award in Australia. In her own version of life imitating art, Barbara and her husband currently live on a misty hillside in beautiful Far North Queensland where they keep heritage pigs and chickens and an untidy but productive garden.